One of the big research tasks during the first expedition was deploying our deep mooring – a nearly 80-foot-long cable outfitted with over 10 different instruments. This one was longer and had more instruments than the rest of the moorings, and it was the only we one we deployed from aboard the Amber Anne. This made the timing of everything both exciting and challenging. Prepping the mooring involved a lot of steps – while attaching all of our instruments, the long cable was coiled in figure eights across the deck (the total mooring cable length is over 150m, nearly 500ft long!). We had to keep the line from getting tangled up and keep a log of instrument locations so that we would know which instruments were measuring at what depths. This mooring suspends a series of RBR fast temperature profilers at 10-meter increments – which will help us learn a lot about mixing in the water column at different depths. We also attached two CTDs and an Acoustic Doppler Current Profiler (ADCP) to gather data about temperature, pressure, salinity, and currents in the water. The top of the mooring has a oval float, shown here with Jonathan inspecting it. But that oval isn't providing most of the floatation. Most of the floatation is in a giant float - 3 ft in diameter. ALL OF THIS Is totally underwater, otherwise icebergs would destroy it. So how do we get it back? There is a mechanism at the bottom that has a hook that will release from the anchor when it hears a specific pattern of sound - a code. It is risky. 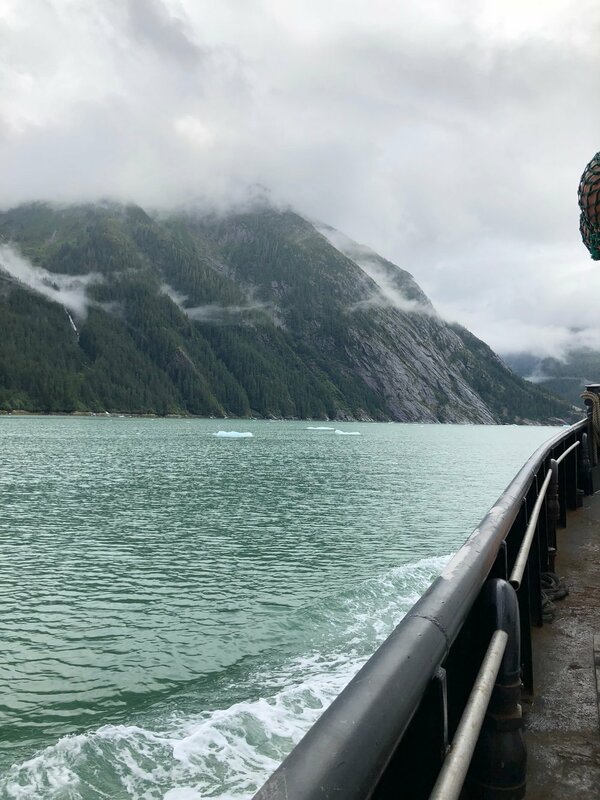 If the release fails, we can't get the mooring and all the data back very easily (we can try to drag the bottom of the fjord for it and try to hook it from the boat). In the photo below, Jonathan is showing off one of our small moorings, which will go right up next to the glacier. In the upper left of the photo is the giant ball that is for this deep mooring and the yellow instrument at the right is the mechanism designed to release from the anchor. 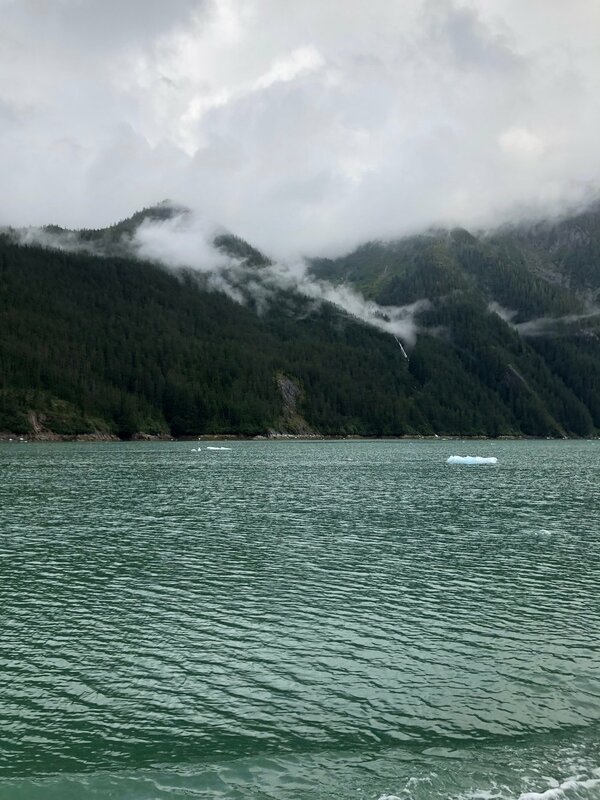 I think deploying this mooring was one of my favorite parts of this trip – the whole team was involved, and everyone had to coordinate to get all the different parts of the mooring into water at the right time and place, and it was thrilling. Communication between the bridge and the deck was key because the Amber Anne had to be travelling at the right speed as we dropped in each part of the mooring. June and Johnathan worked on getting big instruments off the deck with the crane, while other members of the team radioed the bridge, kept track of when instruments were put in the water, and fed cable over the side of the boat. The best part was watching each of the instruments disappear into the water once the anchor was released. I got to be a glaciologist for a day which means that I helped Jason carry cameras, batteries, and tripods up to the top of the high rocks above glacier terminus. We were taken to shore in a small skiff and dropped off at the base of this steep, rocky stream bed - this seemed like the best way to hike to the elevation and rocks we were trying to get to. There was no trail, but not a lot of vegetation, so it was relatively easy in terms of navigation to get to the top. We got to a saddle between the rocky cliffs at which point we left the heavy gear and scrambled around to find a good location to set up the cameras. After a bit of walking around, we found the spot - on top of large, flat rock, 220m above sea level. Why? Our goal was to set up two cameras positioned to take pictures of the terminus and fjord during daylight hours every 30 seconds. Time lapse photography is useful to track the movement of icebergs in the fjord, calving events, and capture movement of the terminus. It also helps us keep track of wind and rain events and anything else that might affect our data. In this project in particular, tracking the movement of icebergs can tell us something about the surface circulation patterns in the fjord. Once we set the tripods up in a good position, we had to gather a lot of rocks (big and small) to stack around the base to keep it very still during the duration of the deployment. We also attached a GPS to the tripod and let it communicate with satellites for an hour to get a very accurate position. It’s important to have a very accurate position of the camera, so quantifiable data can be collected from the pixels in the pictures. 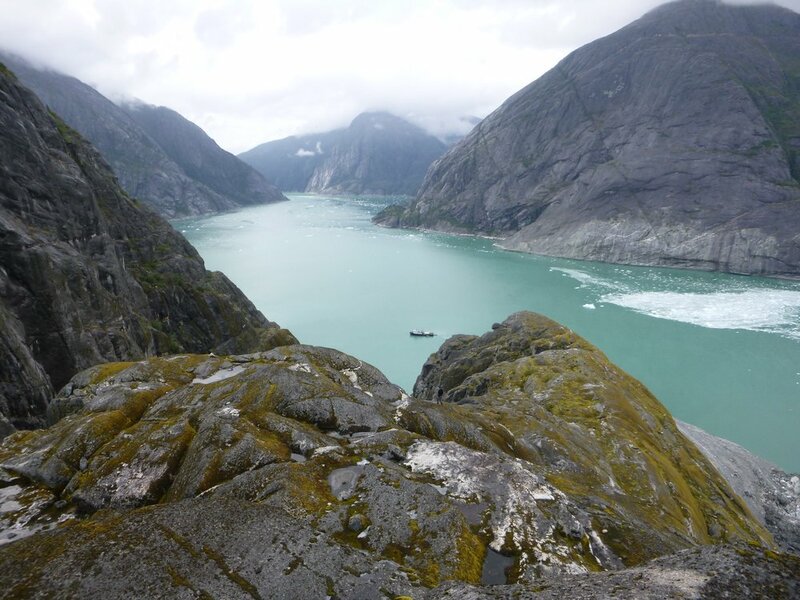 A particularly fun aspect of hiking up so high above the fjord was watching the ship move around (it appears so tiny amongst the high rock walls of the fjord!) and our robotic kayak pulling and successfully deploying the first mooring which was really cool to see from way up above! The following day Akua and Jason hiked up to a lower elevation closer to the terminus to set up 2 more cameras in the same way. A few photos from Akua's adventure with Jason the next day. Sound of Ice is funded by National Geographic Society. 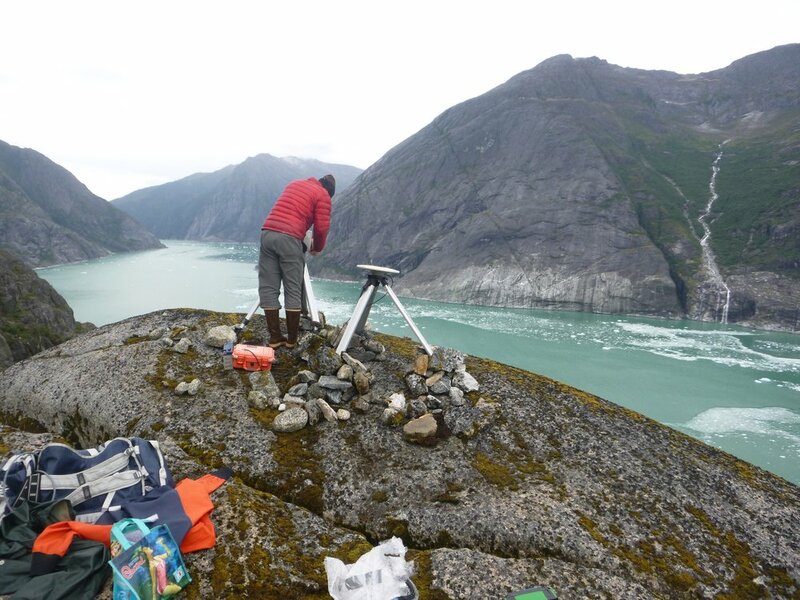 While National Science Foundation has been funding core research in this fjord for the last several years. This particular expedition includes a special, slightly risky, super exciting component that is funded by the National Geographic Society. We are combining Erin's work in acoustics and Jonathan's ability to make measurements with an unmanned boat to push the boundaries of science by using Jonathan's boat ROSE to actualy deploy a mooring that has hydrophone sensors on it to "listen" to the glacier, right up at the base of the ice cliffs - closer than anyone has before. In a tribute to National Geographic's support of this project, we thought it fitting to design our mooring deployment "raft" as the classic NGS rectangle. We will add photos showing ROSE in action here soon!